Dosing processes had to be optimized at Franklin Electric’s Czech production site. 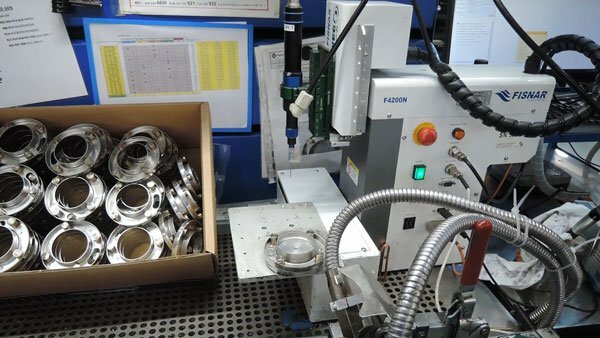 The employees of the internationally leading pump manufacturer for water and fuels faced a special challenge: The waste of material during the application process of UV-curing adhesive had to be reduced and the workplaces had to be kept clean. The dispensing equipment used so far was very inaccurate. In addition to high material costs, this also always entailed a high cleaning effort. Already after the first tests the preeflow dispensers convinced. And Vieweg GmbH, as a partner of preeflow, could successfully support the integration of the new dosing system. By using the preeflow® eco-PEN450, made by ViscoTec, a repeatable, precise volumetric dispensing with perfect dosing results is guaranteed. Until now, dosing the adhesive was only possible with large amounts of dirt and the associated material and cleaning costs. The progressive cavity pump now used has a reliable retraction function. This in turn guarantees cleanliness on the workpiece and at the workplace – as well as precise dosing. The integration of the new dispenser was very simple and is also very easy to implement for the operator at the workplace. Now it is possible to dispense without contamination. This results in considerably less cleaning effort. And with it, also a shortened process time in this area. Franklin Electric, headquartered in the USA, stands for innovation and quality. The company is constantly striving to improve internal processes. They work with high-tech machines, now also with a dispenser from preeflow®.